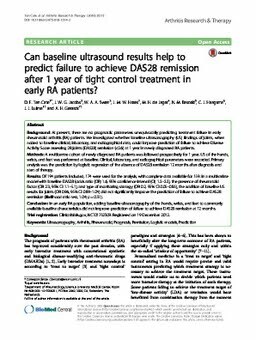 RePub, Erasmus University Repository: Can baseline ultrasound results help to predict failure to achieve DAS28 remission after 1 year of tight control treatment in early RA patients? Background: At present, there are no prognostic parameters unequivocally predicting treatment failure in early rheumatoid arthritis (RA) patients. We investigated whether baseline ultrasonography (US) findings of joints, when added to baseline clinical, laboratory, and radiographical data, could improve prediction of failure to achieve Disease Activity Score assessing 28 joints (DAS28) remission (<2.6) at 1 year in newly diagnosed RA patients. Methods: A multicentre cohort of newly diagnosed RA patients was followed prospectively for 1 year. US of the hands, wrists, and feet was performed at baseline. Clinical, laboratory, and radiographical parameters were recorded. Primary analysis was the prediction by logistic regression of the absence of DAS28 remission 12 months after diagnosis and start of therapy. Results: Of 194 patients included, 174 were used for the analysis, with complete data available for 159. In a multivariate model with baseline DAS28 (odds ratio (OR) 1.6, 95% confidence interval (CI) 1.2-2.2), the presence of rheumatoid factor (OR 2.3, 95% CI 1.1-5.1), and type of monitoring strategy (OR 0.2, 95% CI 0.05-0.85), the addition of baseline US results for joints (OR 0.96, 95% CI 0.89-1.04) did not significantly improve the prediction of failure to achieve DAS28 remission (likelihood ratio test, 1.04; p=0.31). Conclusion: In an early RA population, adding baseline ultrasonography of the hands, wrists, and feet to commonly available baseline characteristics did not improve prediction of failure to achieve DAS28 remission at 12 months.